May is a horrible month for my family. Horrible, yet wonderful at the same time. There’s Mother’s Day, my nephew’s birthday, my brother and sister-in-law’s wedding anniversary, my grandma’s birthday and my dad’s birthday. Generally, this means there’s a lot of celebrating and over eating. Celebrations means cake of course, but by the time we’re at my dad’s birthday we’re usually all caked-out. Still, you can’t have a birthday without cake, so I made my dad a tiny coconut cake just big enough for the seven of us to share. 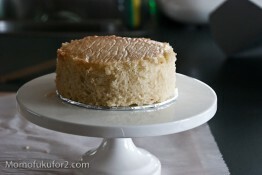 This coconut cake is moist and coconut-y due to the coconut milk and shredded coconut in the batter. For me, the best part about making a cake for someone, aside from the look on their face when they see and taste it, is lopping off the tops to eat. Layer cakes have to be even, but cakes don’t usually bake up flat, so there’s quite a bit of cake you can eat right away. This recipe bakes up great as cupcakes as well, and actually, that’s what the recipe’s intended for, but I find cake so much more festive. Note: I grossly miscalculated and thought I wouldn’t have enough batter, so I doubled this recipe and had a major disaster as you can see from the photos. 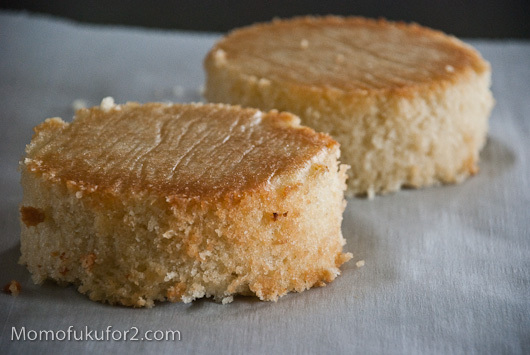 If you’re planning on making mini 4 1/2 inch cakes, follow the recipe below! Preheat the oven to 350˚F. 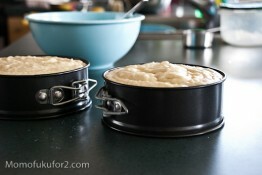 Line two 4 1/2 inch springform pans with parchment circles. 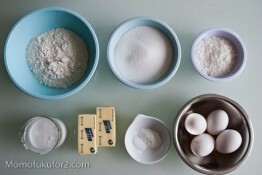 Add the dry and wet ingredients. Start by adding a third of the dry ingredients, mix, then add half the wet ingredients, mix, add another third of the dry ingredients, mix, add the last half of the wet ingredients, mix and then add the remaining third of the dry ingredients. Divide the batter evenly among the two pans and bake for 45 minutes or until a toothpick inserted in the middle of the cake comes out clean. Smitten is my favourite food blog on the net, partially due to her candor, but mostly due to the fact that I trust her recipes. Out of all of the recipes I’ve made from her site, not one has been a dud. It’s no surprise that Deb is one of the most popular food sites ever and I was very pleasantly not-so-surprised when I saw a discreet button on her sidebar announcing The Smitten Kitchen Cookbook. Congrats Deb! 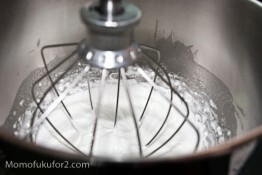 Whisk the egg whites and sugar in your metal mixer bowl over a pot of simmering water. Continue to whisk until the sugar is dissolved. Test by dipping a finger in and rubbing it against another finger. If you can feel any grains of sugar, you’re good to go. Lift the bowl off the pot of simmering water and be sure to wipe away and water condensation on the bottom of the bowl. 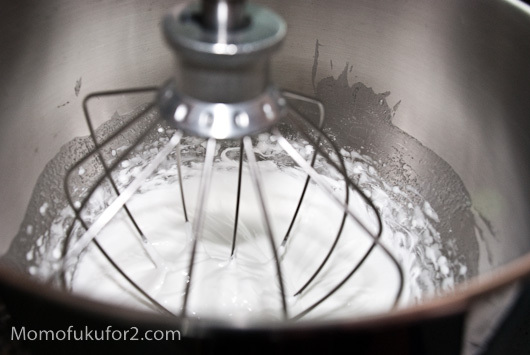 Using the whisk attachment, whip the egg mixture starting on low a low speed and moving to high until it turns white and doubles in size. The eggs will cool down while whipping and when you touch the bottom of the metal bowl, it should be cool before you add any butter. 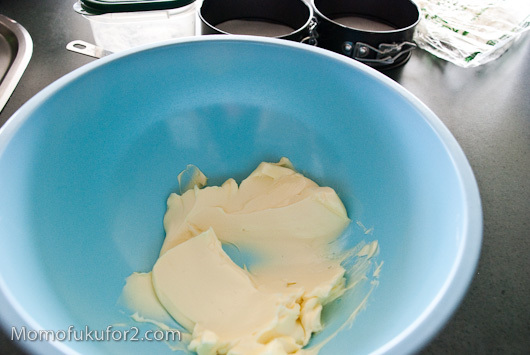 Switch to the paddle and slowly whip in the butter a tablespoon at a time. 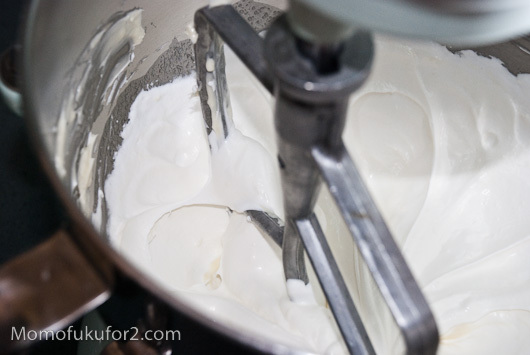 The mixture might look like it’s curdling, but it will come together into a lovely fluffy mass of delicious, not-too-sweet frosting. When all the butter is whipped in, add the coconut extract. 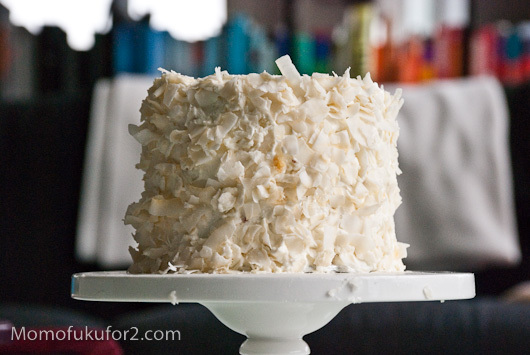 Omg Steph…i <3 coconut and this is the ultimate coconut cake! The buttercream only makes it better. You're gonna have to make this for little Nathan/Ethan/Tristan's 1st birthday or SOMETHING! Hehe jk. Keep up the great work! Hahaha, I’ll make it for his one month celebration! 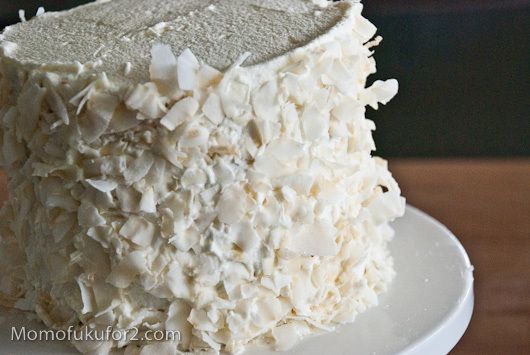 Finally, a coconut cake that has actual coconut milk in it. Would toasting the coconut add to the taste, or would that be too much? I was thinking of toasting the coconut, actually. I love the deeper flavour you get from it! Maybe next time, I’ll cover the sides with toasted. I’m not a fan of coconut, but these pictures make me want to be. GORGEOUS. Thanks! You should give coconut a try. Mike doesn’t like coconut either, but he loves this cake. Thanks! You could have actually had a piece! We only ate about 3/4 of it! First off: I love baking cakes just so I can lop off the top and test it out beforehand. I made a rum carrot cake over the weekend, and still have the scraps sitting in a bowl waiting to be devoured! 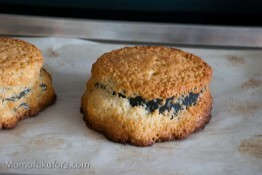 Second: Smitten Kitchen is also one of my favorite blogs! I’m so excited for Deb’s cookbook to come out. 2012 is just too far away. 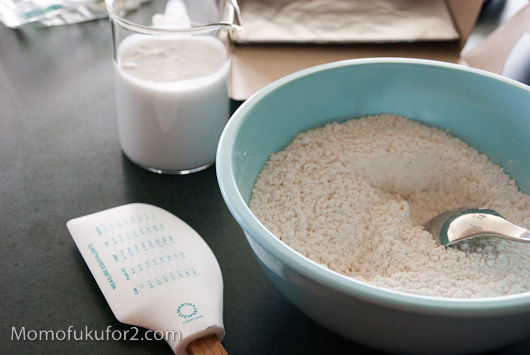 The best part about baking cakes is the lopping! Happy lopping to all! I like the mini version! I’ll have to use my mini springform pans for this too! I love making mini cakes. It makes people feel better about how “little” cake they’re eating! 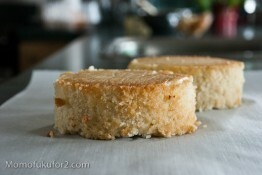 That looks yummy – I’ve never really baked with coconut before. I love making mini layer cakes. 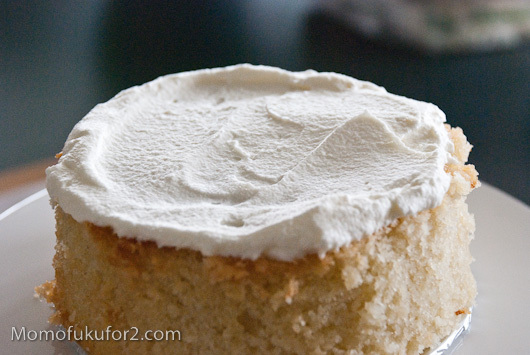 Mini layer cakes are the best! They’re so much easier to ice. oh my lord… this is beautiful. i so wish the cake would pop out of the screen and straight into my mouth. OMg i love this cake!! So can this recipe also make a 9 inch cake? Ive never made mini cakes. Steph, When baking a cake of any size, what is the rule of thumb for how full to fill the pans with batter. I have tried to make little cakes (4 1/2″ and 6″)out of full-size cake batters and messed up w/ too little batter in ea. pan. I can adjust if I could know what is right: a little over half? 3/4ths? I don’t see in the directions how the sides are done, or what it is… a type of coconut? Thanks! It’s gorgeous though!!!! 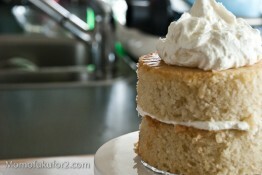 I think I gained weight just looking at this cake…Can’t wait to try!! Where do you buy unsweetened coconut? I can’t find it in my area.